Spike Jonze is currently serving visual feasts on a platter. 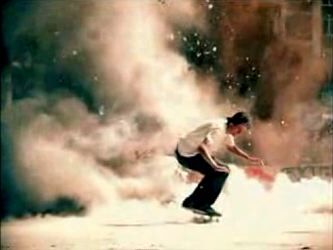 What with the Flashing Lights video, the recent leak of upcoming third feature (adult reimagined) Where the Wild Things Are, and now exploding skateboarders (in this extreme intro video for lakai), Jonze is back on a creative hotstreak, and seemingly obsessed with slo-mo. Watch it quick. Youtube link below.